Welcome back to the Pokemon Omega Ruby: Knights of the Old Republic Nuzlocke playthrough! Last week we got our first Star Map and second badge by defeating Brawly, although no Pokemon in Dewford Town could be caught. Now we move on to collect more companions! T3-M4 is actually the first character that you play as in the game. This is also a KOTOR companion, so the question of whether it can be caught again is a question that will need to be addressed fairly soon. 3C-FD is, for our purposes, a clone of T3-M4. While in Knights of the Old Republic II it seems to be destroyed in between fixing the engine and docking, we are not in the habit of releasing our Nuzlocke Pokemon if they haven’t been defeated in battle, so 3C-FD is a valid capture with the options of Steel, Grass, Bug or Electric. The Jedi Exile is a player character with 9 possible classes and open alignment. Rather than try to compile that into a comprehensive list excluding one or two types, this is going to be a Wild Card. The 12th (or 13th, depending on our decision about T3) capture can be any type that is encountered. Kreia is a Neutral Jedi Consular (who presumably reaches Sith Lord around level 30). You might consider her to be Dark, but since you can’t actually get her to that point through normal gameplay (she gains her Dark Side points after leaving your party) she is firmly in the Neutral camp here. She can be Psychic, Ghost or Electric. Atton Rand is another one that is staying Neutral as a combination of his personality and the mechanics of KOTOR II. You can gain favor with him with a combination of Dark and Light acts, meaning that he falls on the side of neither. He can be Normal, Water, Ice, Poison, Psychic or Water thanks to his future multi-classing. Bao-Dur is our next companion. I didn’t initially work in rules for a Tech Specialist, but the fact that he carries around a remote helps. Thanks to his multiclassing, Bao-Dur can be Normal, Electric, Fire, Steel, Psychic, Fighting or Dragon. Since this is taking up quite a bit of word count in a normally short column, let’s hold off a bit here so we can continue the Let’s Play, yes? Before meeting Jolee, we meet Steven. I’m honestly not sure how he fits into the larger KOTOR narrative at this point, but he may well be one of the members of the Jedi Council that appears in both games, putting him at odds with Darth Scion (Maxie) and Darth Nihilus (Archie). He gives Revan some training (in the form of Steel Wing), so the pieces may be falling together. From there, we begin battling in Route 109 against all of the Sailors and other trainers there. The only truly remarkable event to happen here is that T3 barely survives a battle against a trainer’s Wingull after becoming confused and then being dropped to 1 HP, but he gets by. While it’s going to be a struggle to get him to learn Dig, he’s becoming a solid, reliable member of the team. From here, we battle Team Magma in the museum. Not much to say here; Scion makes an appearance but doesn’t fight us. After this we head north, running into Jolee in Route 110. Jolee turns out to be a level 11 Lightning Rod Modest Electrike. Still in the first patch of grass of Route 110, we encounter our first flying type since we beceame eligible for the Ebok Hawk (although I could have caught a Magikarp in Dewford if I had thought to look for one). 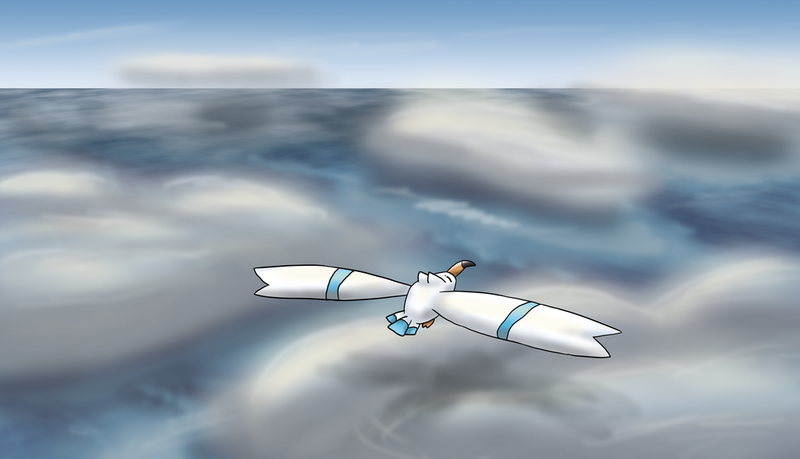 This Quiet, Keen Eye Wingull has become our transportation. For those not sure what I mean (or who haven’t seen the rules of this playthrough in a while) I’m using the Ebon Hawk optional rule for this playthrough. That means that the first post-Canderous flying type I encounter (outside of the usual one-per-route) becomes the Ebon Hawk, and once captured, this Pokemon must be in the party any time I travel from one route to another. Having a Wingull for this purpose makes this extremely useful because as a Pokemon that can Surf, Dive, traverse Waterfalls and Fly, Pelliper is one of the most useful HM slaves in Hoenn. 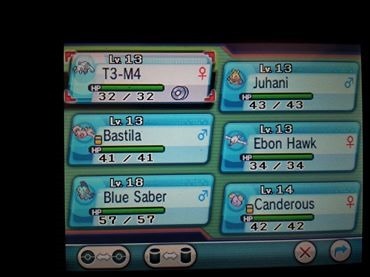 And so, for the first time since the beginning of this playthrough, we end this post on a photo of a full 6 member team!